Over the last few years, designer Samuel Ross has established himself as a vital, visionary voice in British fashion. Blending high concept ideas with cutting-edge technical design and clothes people actually want to wear, his brand A-COLD-WALL* has earned him a shot on the LVMH Prize shortlist as well as two nominations for The Fashion Awards. More importantly than institutional approval, though, it’s grown him a global follower base of dedicated fans who proudly rep his utilitarian, industrial aesthetic. Tomorrow, Ross is launching a brand new collaboration with Nike via an immersive pop-up in London’s Shoreditch – but this isn’t your average sneaker drop. For Ross, who didn’t have much chance (or the financial means) to line up for trainers growing up in Northampton – “I bought a pair of fake Nikes on a council estate for £20”, he offers as an alternative – it’s an opportunity to push the ideas of retail in a way that fits the intellectual ethos of the brand he’s built. In the darkened cinema room, visitors can watch films play on loop – including a previously unseen four-minute editorial film, which features a model wearing the collection in a wasteland landscape which blends the natural (mud, water), with the industrial. As Ross puts it: “it’s pure ACW”. 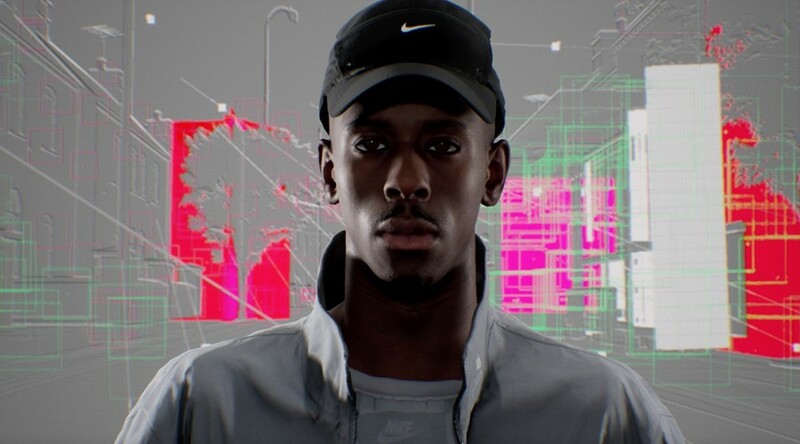 The second is the campaign film produced with Nike; a futuristic, 3D rendered vision which features two models (one is athlete sprinter Reece Prescod, another is the designer’s partner Jennifer) walking on a treadmill. Everything – from the backdrop to the clothes – was added in post-production, with a final film revealing the behind the scenes footage showing the making of such a technically ambitious project. After the darkness of the second space, the white fluorescent light of the final room is almost blinding. In its centre is an installation created with students of the Architectural Association – the collection hangs in the middle of the floor, with row upon row of tiny terracotta-coloured clay pyramids beneath it. They aren’t just to look at – visitors are allowed to stand on them to go up and interact with the clothes, meaning the tiny structures will soon be entirely smashed. “When you walk on the floor, they will crack… by the end of tomorrow it’ll just be piles of rubble,” Ross says. Working with the students as they’ve interpreted A-C-W* has been particularly inspirational for the designer – “I have so much respect for them,” he says. After the smash success of his Air Force 1s, Ross has taken on the Nike Zoom Vomero +5, drawn to the particularly 00s model because of the fact that the technology is exposed on the outer part of the shoe. It’s a hi-tech design vision that’s a million miles away from the glossy perfect shell of things like iPhones, meaning “there are so many different components to mess around with.” In his iteration, which features a plastic built-out heel, the protective coatings have been stripped off the exterior. This means that the shoes are intended to change and age through wear, prompting a real human, individual connection to each pair. Beyond the shoes, there’s a parka made of a Japanese nylon that softens with heat and wear, trousers, and a longsleeve tee. After what Ross describes as the “chaos” of his last Nike drop, limited spots were released online for the pop-up, although, unsurprisingly, they were massively oversubscribed within hours. If you don’t get a chance to visit the installation, there’s not long to wait – the collection will be released November 29 by Nike and will be available in Dover Street Markets worldwide.